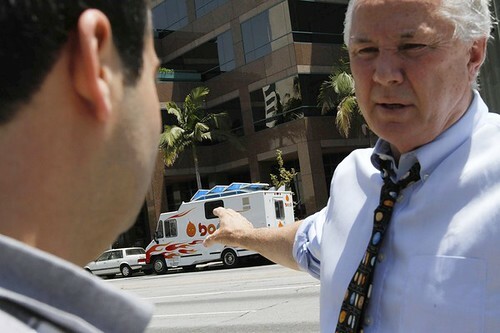 Councilman Tom LaBonge wants to ban food trucks from city streets. LaBonge‘s beef is with the gourmet food trucks that park along Miracle Mile. The area is in LaBonge’s district and local restaurants have complained to LaBonge. Now LaBonge has introduced two motions that the LA times says could lead to food trucks being banned on city streets. So lets recap. Local restaurants in miracle mile serve overpriced boring food. Food trucks realized the business opportunity and moved in, parking in front of the office buildings. Office workers chose the food trucks over the local restaurants. Local restaurants complain that it is unfair. 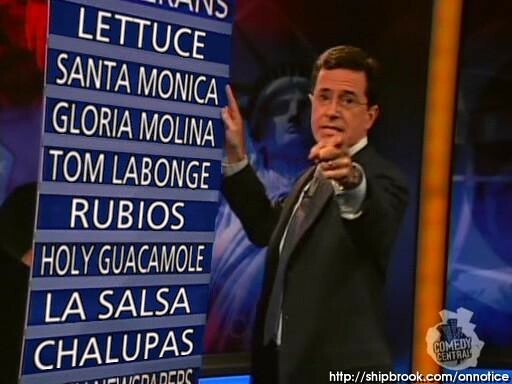 LaBonge realizing where is bread is buttered starts his anti-food truck crusade. Last Friday, Los Angeles City Councilman Tom LaBonge waded into the mounting squabble by introducing two motions that could lead to food trucks being banned on many city streets. One proposal asks city staff to study what other cities have done and to look into prohibiting trucks from parking at metered spaces in commercially zoned areas. The other calls for a report on the creation of specially designated catering-truck parking zones. There's already a petition with over 5500 signatures opposing the motions and an anti-LaBonge facebook page. Ok this is my favorite part....Tom LaBonge! you're on notice! How do you balance the low overhead of a truck which is why they are cheaper since they are parked on public land that are not paying for. Competition is good, but only when it is a fair battle. Maybe there should be a parking tax or something to help level the playing field or a break for the fixed sites.